A roundup of all the best, most cutting edge, feature rich digital chess clocks of 2019. Digital chess clocks are one of the most recent innovations in a game that’s older than some entire civilizations. They have revolutionized the game of chess in recent years by making it possible to play thousands of different game types all at the press of a button. The most advanced digital chess clocks in 2019 have preset time settings that can store almost one hundred different rule variations, making it possible to play a different kind of game each time you sit down at the chess table. They also provide a convenient way to simply keep track of one’s turns and make sure that no one player is taking to long or holding up the game. Which way the technology is used is determined by the player. It’s up to you to decide whether you want to use your digital chess clock as a facilitator for complex timed games, a simple time tracker, or a technologically advanced paperweight. Because everyone uses their digital chess clocks a bit differently, everyone will have different needs when it comes to the perfect chess clock. That’s why we’ve put together this list of the top digital chess clocks available in 2019. Read on as we review each one and its features to decide which one would be the best fit for you. This product is a digital chess clock and so much more. 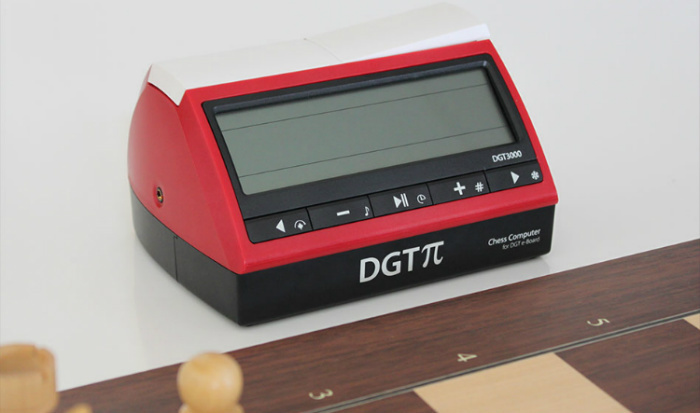 The DGT Pi Computer is hands down the single most technologically advanced, cutting edge piece of commercially available chess equipment on the market in 2019. This is the smartest clock out there, so if you’re someone who appreciates a rich set of features and likes to get the most out of each setting, pre set, and function, then this is definitely the digital chess clock for you. As a clock, The DGT Pi Chess Clock can perform 25 different preset modes including simple blitz timing, action chess, or tournament modes as well as handling all popular delay types (Fischer, Bronstein, and US Delay.) It also has 5 slots for your own customized timing settings, but all that is not even scratching the surface on what this thing can really do. 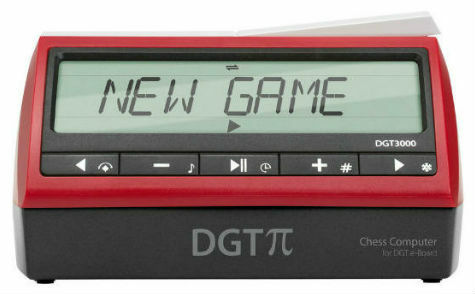 When paired with any of DGT’s electronically enabled chess boards, The DGT Pi becomes a powerful chess computer capable of analyzing games in real time, or playing against you using any of the following included chess engines: StockFish, Texel, Arasan, Rodent II, Zurichess, Floyd, Cinnamon and Claudia. The eight different chess engines programmed onto this device offer players a wide variety of different strengths and play styles to choose from, so things never get boring. In order to make the most of this full functionality, though, you need to use The Pi chess clock with one of DGT’s E-Boards, so we recommend purchasing them together as a set. The VTEK 300 Ultimate Chess Clock is a very popular choice and has become a best-seller in the digital chess clock category because of its durability and functionality. Even though this chess clock has all the features that the average chess player would ever need, it is simple and easy to use straight out of the box. It comes in 3 attractive colors – black, white, or blue, and can be bought with a protective carry bag for an additional fee. The display on The VTEK 300 Digital Chess Clock is large, bright, and brilliant, with a set back design that makes it easy for both players to read the numbers at a glance. It runs on 3 AA batteries, which will provide about 850 hours of active gameplay, or last for about 2 years while in idle mode. The clock also features a handy low battery warning feature that will begin flashing when about 12 hours of gameplay remain. This ensures that you have enough warning to be able to change the clock’s batteries and you’ll never be caught in the middle of a game- or worse, a tournament- with a clock that suddenly shuts off. This clock has a metal frame which makes it very durable and difficult to break. Even after several drops and dings, The VTEK 300 will keep right on ticking. This makes it a great choice for children or the very clumsy who may be prone to accidents that endanger their possessions. The VTEK 300 can take a beating! The DGT North American Chess Clock is a great, low cost option for buyers on a budget. It offers an entry point into the world of digital chess clocks that is affordable to those who don’t want to spend hundreds of dollars on one. The DGT North American Chess Clock also offers a great value for the money with 10 built in algorithms to cover all of the most widely used chess playing modes. It can even handle multi period delays. The quick set options are easy to use and with a touch of a button you could be playing with modes like time, time + guillotine, 2 X + guillotine, time + repeating time, bonus (“Fischer”) options, time + bonus, 2 X time + bonus, bonus single period, or bonus tournament. This digital chess clock also includes a manual mode that lets you customize your time settings and saves them in its memory automatically. It can also be used to time any two player game, like go, shogi, checkers, Scrabble and many others. The DGT North American digital chess clock comes with two AA batteries included, as well as a low battery warning feature that will let you know when it’s time to change them. It has a sound alert option that you can turn on to signal when someone’s in time trouble, and an impressive 16 different contrast settings so that you can adjust to any lighting conditions. The display on this digital chess clock can be made clear and visible in any setting from full outdoor sun to low basement lighting. Ready to Buy Your Digital Chess Clock? So, there you have our roundup in 2019’s best digital chess clocks. You can’t go wrong with any of the clocks on this list. They are all high quality products made by trusted brands, and depending on the features you prefer in a digital chess clock, any one of them might work for your needs! If you’re looking for a chess clock that can do it all and then some, try the DGT Pi Computer. 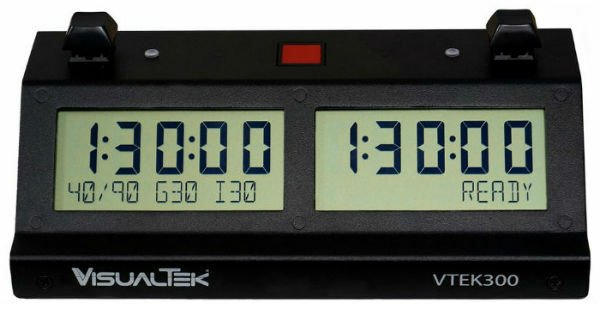 If you prefer an intermediate chess clock that has all of the features you need but is still simple to use, we recommend the VTEK 300 Ultimate Chess Clock. If you’re looking for a budget option that will just get the job done, the DGT North American Chess Clock may be the one for you. If you weren’t able to find a digital chess clock that seemed like a match for you, don’t give up hope yet! We have plenty of other reviews and recommendations on our other pages. Check out our list of the best Chronos Chess Clocks or, if you’re not sure you want a digital chess clock, try looking over at our main Chess Clock page. That article contains information and reviews on analog chess clocks as well as digital ones.